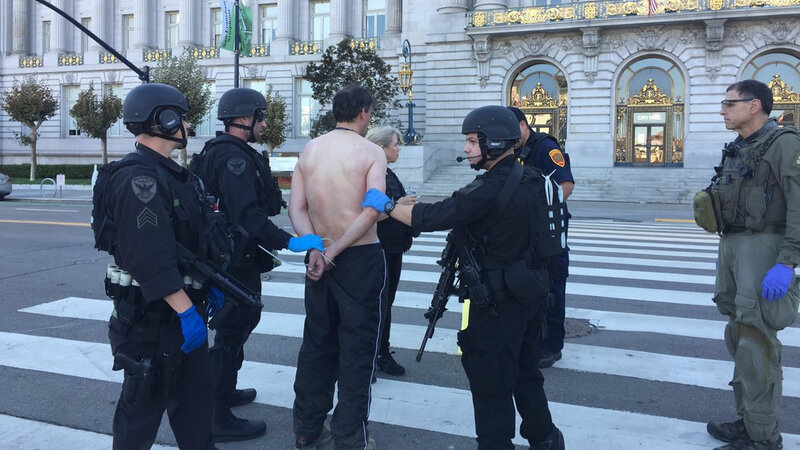 SAN FRANCISCO (KGO) -- San Francisco police have reported the gunman involved in an hours-long standoff in the Civic Center Plaza has surrendered to police. The incident was first reported by San Francisco Fire Department officials on Twitter around 12:25 p.m.
Police and fire officials initially evacuated the plaza and asked people to avoid the area. Police say the armed man called police just before noon and was threatening to use it. "This person has a semi-automatic handgun. He has threatened to use the gun on officers and on himself," said San Francisco police officer Carlos Manfredi. SWAT Team units and police negotiators are on scene trying to convince the man to surrender. "Right now our negotiators are trying to establish a dialogue with man find out what's going on and try to end this peacefully," Manfredi said. The armed man has been talking to police. "He's using words that he may want to end his life or take out other people and we don't want that to happen," Manfredi said. Hundreds of people live inside the evacuation zone, not knowing when they might be allowed to go home. Police say they are in no hurry to end the standoff and it could continue for several hours.